A guided tour is the best way to visit Vicksburg National Military Park’s historic battlefield, the USS Cairo Gunboat & Museum, and the Vicksburg National Cemetery. This post is the fifth installment of a 6-part Mississippi Road Trip series. The first segment entitled How My Books Landed in the de Grummond Collection at USM details the backstory of my drive from Central Florida to Hattiesburg. On the second leg of my journey I traveled to Historical Natchez, Mississippi, where I toured 4 of this city’s grand antebellum homes. Part 3 is the story of my drive on the Mississippi Backroads Between Natchez and Vicksburg where I visited a ghost town, walked the cinematic Windsor Ruins, and ate the worlds’s best fried chicken. Then I learned How to Spend 36 Hours in Vicksburg, Mississippi. And finally, I visited highlights from several Civil Rights and Literary Driving Tours in Jackson, Mississippi. Although Vicksburg, Mississippi, is a great destination for music, dining, shopping, and even gambling, let there be no doubt that Vicksburg National Military Park is the city’s most prominent attraction. As well it should be. In addition to the historic battlefield, the park is also home to the U.S.S. Cairo Gunboat & Museum, and the Vicksburg National Cemetery. It should come as no surprise that, as an amateur history buff and an obsessive collector of National Parks Passport stamps, Vicksburg NMP had been on my bucket list for years. I always assumed that when I finally made it to the park I would collect a unigrid (NPS official brochure and map) at the Visitor Center and do a self-guided tour like I always do. Little did I know that when it finally happened, as a guest of Visit Vicksburg, I would be accompanied by a personal licensed tour guide and chauffeur. Word on the street had it that as tour guides go, David Maggio was the best of the best, and my experience soon proved the accuracy of his reputation. After breakfast, I met David at the Vicksburg NMP Visitor Center to begin the park tour. So that I could give him my undivided attention and have freedom for photo ops, David climbed behind the wheel of my Mountaineer, and we proceeded through the Vicksburg Memorial Arch and onto Union Avenue. To fully immerse oneself in a visit to a historical site, it is always best to have a basic understanding of what happened there. Upon my request, David was kind enough to contribute two brief histories to this article. This is a good thing on two accounts. It prevents me from including historical inaccuracies in the text, and it gives our readers a taste of David’s guided tours. The most memorable highlights of our drive along Union Avenue were David’s detailed tour of the Illinois Memorial, seeing the adjacent battlefield now cleared of trees and brush for historical accuracy, and hearing David tell the story of Thayer’s Approach on location at the tunnel while facing the Confederate fortifications above. A historically accurate battlefield, cleared of trees and brush. Remains of the Union tunnel in the foreground and the Confederate line above at Thayer’s Approach. The U.S.S. Cairo was an unexpected highlight of our park tour. Somehow the sight of this gunboat resurrected from the river just blew me away. Historical sites and memorials are great, but nothing compares to tangible artifacts, especially when they are the size of this leviathan. Of course, having David along to share the details of the ironclad’s design and and the story of its demise brought the experience to life. The U.S.S. Cairo was one of seven city-class ironclads designed by Samuel Pook and built by James B. Eads to retake control of the Lower Mississippi River from the Confederacy. They were named city-class vessels because all were named for cities on the Mississippi and Ohio Rivers: Cairo, Carondelet, Cincinnati, Louisville, Mound City, PIttsburgh and St. Louis. Each of the seven ironclads were 175 feet in length, 51 feet wide, and amazing as it sounds, the tonnage fully loaded was 888 tons, although they had a draft of only 6 feet. The boats averaged 14 inches of white oak, covered with 2 1/2 inches of iron plating. These vessels were designed to travel in the waters of the inland rivers, brown-water navy, as opposed to the oceangoing blue-water navy. The ships burned coal at a rate of one ton per hour, heating water to create steam that operated two steam engines which turned the paddle wheel at a rate of 6 knots. There was a crew of 17 officers and 158 sailors. On December 12, 1862, the Cairo was operating in the Yazoo River 7 miles above Vicksburg, when it was rocked by two explosions from torpedoes (underwater mines) that tore two massive holes in its hull. Within 12 minutes the ironclad sunk. Not found until 1956, and finally raised from its watery grave on December 12, 1964, today the Cairo is restored and on display in the Vicksburg National Military Park. Model of the U.S.S. Cairo. Personal effects of the U.S.S. Cairo crew. One of two Confederate burials is marked with a flag in the shade of a tree. The basic entrance fee to Vicksburg NMP is $12 per vehicle, and the pass is valid for seven days. Additional fee information may be accessed at this link. and then there is the best way . . . . Hiring your own personal tour guide is the BEST way to visit Vicksburg NMP hands down! The licensed Vicksburg Battlefield guides are experts in their field, having passed multiple written and oral exams on every topic pertaining to the Vicksburg campaign. Each guide is different, bringing their own perspectives, specialties, and personalities to craft a unique tour for their clients. They are your personal chauffeurs, driving your car through the park, leaving you distraction-free to enjoy your guided tour and hands-free for photo ops. Guides are flexible, allowing you to decide which park locations to visit and how much time you spend at each location. Hiring a tour guide from Vicksburg Battlefield Guides is extremely affordable! A 2-hour guided tour is only $40 for up to 6 passengers in one vehicle. You may add additional hours to your tour for only $20 per hour. Availability information and reservations can be made through the Vicksburg Convention and Visitors Bureau by calling (601) 636-3827 or the Vicksburg NMP Visitor Center at (601) 636-0583. You may contact the amazing David Maggio personally by email or by calling (601) 831-5869. Jerry and I enjoy dialogue with our readers, especially when they share stories and tips from their visits to National Parks. 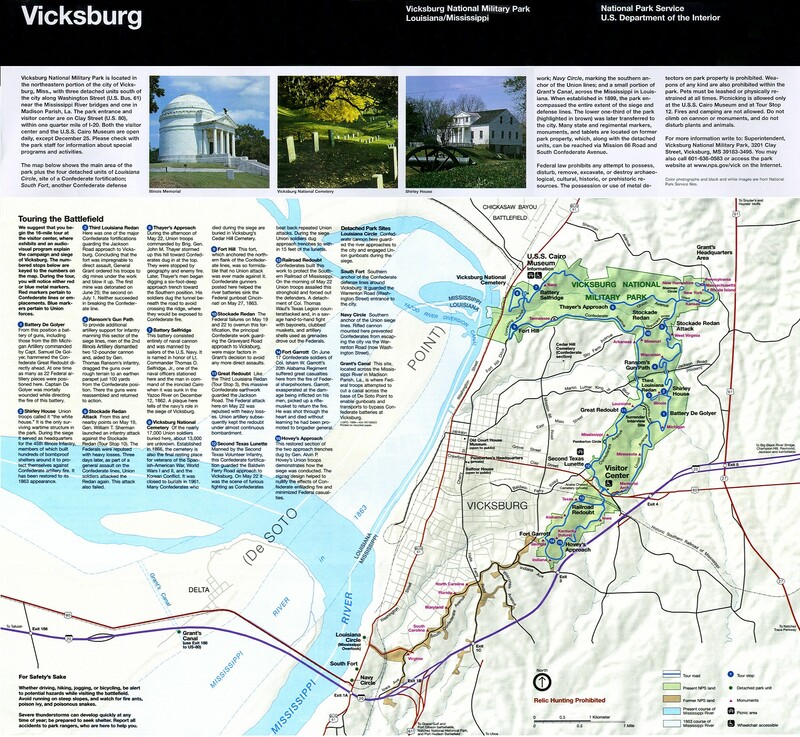 Have you ever visited Vicksburg National Military Park? If so, we would love to hear about your experience. We invite you to leave your comments and questions below, and we always respond! Howard Blount is founder and co-owner of the travel web site Backroad Planet. He has traveled internationally since boyhood and lived abroad in Mexico, Chile, and Paraguay. Now his passion is navigating the roads-less-traveled of this amazing planet in search of anything rare and remote. On the stuffy side, “Mr. Blount” has been a writer, consultant, and published author with the likes of Simon & Schuster and McGraw-Hill. Recently retired from a 35-year career as a middle school teacher, Howard enjoys spending his time on anything that includes mountains, waterfalls, dachshunds, gospel choirs, books, restored classic movies on Blu-ray, HDTV, autumn, sandhill cranes, hot springs, Florida springs, rain and other gloomy weather, log cabins, cracker shacks, abandoned sites, unearthed history, genealogy, museums, documentaries, To Kill a Mockingbird, scenic and historical sites, castles, cathedrals, the Civil War, cold sheets, National and State Park Passports, quotes, the Rambos, Dionne Warwick, Steely Dan, Doobies, Diet Pepsi, Fish City Grill, anything Apple, all things British, Jesus, and lists. And on a random note, Howard is a fourth cousin once removed to Truman Capote. I barely visit historical sites but it’s refreshing to know that a place like this exists! Thanks for sharing, Howard! I know! So many different travel styles out there, Trisha. Glad you stopped by. It’s been a few years since I went to the Vicksburg park, but I’ve been several times. I am a Madison, Miss., native now living in Lakeland. I always imagined what it was like fighting in those bluffs and ravines. And the river is amazing at that point. I didn’t know personal guides were available, though. Thank you for spreading the word about Mississippi’s treasures. Hi Sheila! I think we must be neighbors. Jerry lives in Mulberry, and I live in Plant City. Vicksburg is so rich in history! As you can tell, I am in love with Mississippi, and I can’t wait to visit again. the shot of the ironclad from the Mississippi immediately made me think of the Clive Cussler Book Sahara! there is definitely something about “real” artifacts right infront of you! As a bit of a history buff (while not very versed in USA History) i think i would have a great day here! Very cool, Lindsay! I need to check out Sahara. Thanks for sharing! Very nice. I did the audio tour in my car a few years ago. Guess I’ll have to go back with a live guide next time! Stephen, I tried to do an audio guide at the Rijksmuseum in Amsterdam. It was nice, but I found it required dedicated time to listen to everything. I typically get antsy, afraid I will miss something if I stay in one place too long. I guess it is a good idea to know how long the audio tour is before it begins so you can allocate the appropriate time. I call this an epic experience. I feel that with everything I’ve read and saw here, you would actually do well as a leader for a guided tour! It’s all because of how you described each and every historic artifact and location, and I just love that temple-lobby view to the outside. I’m glad a lot of them were restored. I certainly wouldn’t mind adding another guided hour for a trip here, they’ll be expecting me here with my family at some point! You are so kind, Karla! I think I would enjoy being a tour guide, but it would have to be for a location that intrigues me so much I would be willing to put in the work of researching and studying in depth. I am partial to the photo of the Vicksburg battlefield from the Illinois memorial, as well. Thank you! Hopefully, your family gets to visit soon. What a great experience! I completely agree that an excellent guide can make all the difference – I suspect one of the reasons I like blogging so much is that we are privileged enough to be guided on some of the trips we go on. But of course translating that into an experience for every visitor is something different – and the price really does seem amazing value. I typically do not plan for a private tour guide, Fiona, assuming that the rates are beyond my budget. The Vicksburg guides are a great value! I’ve not been to Vicksburg, but I’ve explored plenty of Civil War battlefields. I love the history of that era. Vicksburg is one of the best, Mags. Hope you go for a visit soon! Howard, this guide is so detailed I felt like I was right there with you. I will have to keep David Maggio in mind if we are in the area. A great tour guide is a must for us as we like to learn a lot about the history of places we visit as opposed to just walking around and taking pictures. Thank you, Christina! I try to include enough details and photos to give travelers an incentive to visit and to make it an informative read for non-travelers. I agree that local tour guides make all the difference, especially when visiting historical destinations. Howard, I agree, having a guide is terrific since you can ask him questions along the way. The Civil War is one of my son’s favorite things to study and I can see taking a field trip here down the road. Thanks for all the wonderful information. Wow! What a resource for history buffs. And, I totally am into the idea of hiring local guides. It sometimes can be a bit costly, but the insights gained are remarkable. Local guides are the best, Arnie! I have been on expensive guided tours, but the private tour guides at Vicksburg NMP are the most budget-friendly I have found! Wow – Given the thoroughness of your tour I was shocked to see the fairly low price for the guide. With a few friends or family members, the price per person would be that of a coffee! What a great alternative – especially for someone, like you, who is apt to go it alone most of the time! I agree on all accounts, Julie! I could not believe how cost-effective these guided tours through Vicksburg NMP were. I am frequently guilty of assuming private tours are out of my budget without even checking them out!